I was recently approached to take part in the #MyCosmoStyle challenge. The challenge is to come up with outfits that you would wear to either the Cosmopolitans restaurants or nightclubs. You are allowed to create as many outfits as you like for example you could create an outfit for each different restaurant. The Cosmopolitan is a hotel in Las Vegas which has a wide variety of activities such as going to the salon, playing games in the casino or going to one of the fourteen restaurants. 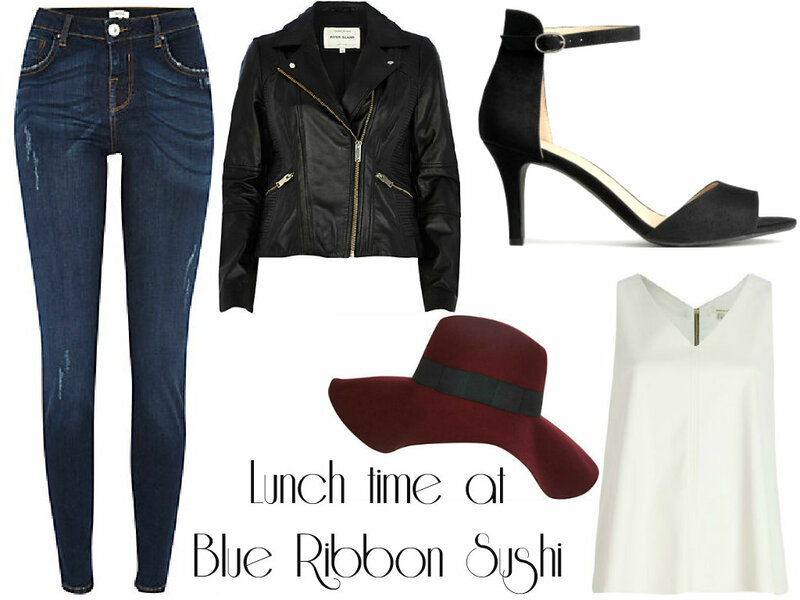 If I were to go for lunch at Blue Ribbon Sushi this would be my go to outfit. Although we’re in Las Vegas this outfit screams simple but classy which is great for during the day. This outfit is also perfect to wear to The Blue Ribbon Sushi as the atmosphere and look of the restaurant is relaxed but still upbeat. The combination of the cream V neck, dark wash jeans and leather biker jacket creates a dressed down look. However the additional fedora and sandals makes the outfit look like you’ve made a bit of an effort. I love pairing sandals with jeans and a pretty top as it looks like you dressed up a bit. It’s a great look for a lunchtime date or just going out with friends in the evening. For dinner I’ve chosen to go for this beautiful white and black bodycon dress which is from Michelle Keegan’s line at London Lipsy. I think I might actually have to purchase this dress myself as I’m in love with it so much. I’ve paired this with these these gorgeous pairs of shoes from River Island which I love as these type of shoes go really well with bodycon dresses. The Chanel bag brings the look together as it adds sophistication and class. Finally I’ve chosen a lipstick which isn’t too bright but not too subtle one which will complete the look and not take the attention away from the dress. I’ve then chosen this beautifully smelling Eau My Gold by Paco Rabanne. The whole outfit is suitable for the restaurant STK as it has a contemporary & modern feel. If you’re booking a holiday to Las Vegas I’d defiantly check out The Cosmopolitan as it offers so much. The rooms are modern and decorated in such detail when I’m old enough to go to Las Vegas I’ll defiantly be booking a room at The Cosmopolitan. It offers so much under one roof and almost makes you forget that there’s more to offer outside the hotel walls. Here is a great website that has lots of information on The Cosmopolitan hotel such as the various hotel rooms available you can also book your trip on this website too. If you guys want to check out more My Cosmo Style blog posts then make sure to check out #MyCosmoStyle on Twitter. I’ve loved writing this post as it’s made me want to go to Vegas so badly unfortunately I still have another three years before I’m allowed to. "Blogs I’ve been loving recently #2"